UV water purifiers were once the most popular kitchen appliances the Indian buyers wanted to buy before the RO purifiers became popular. And even now when most people prefer buying the ROs, there is a good amount of buyers who will prefer the UV water filters for their home. 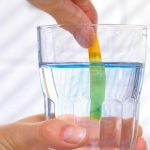 There are several reasons behind this preference and if you are not sure that whether a UV water purifier will work for your home, or you must go for an RO purifier, you must get your water quality and TDS level checked by the professionals. Also, if you having decent quality water at home, then relying on the UV water purifier will be much more beneficial for you. 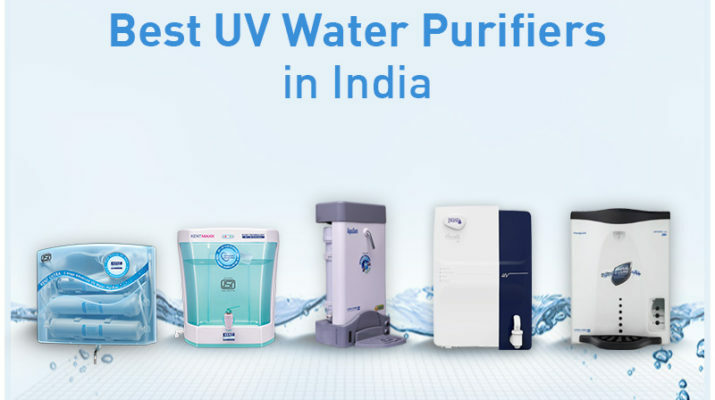 In case you are not able to make a choice and are confused about the numerous models available in the market, here is the list of ten best UV water purifiers in India that you can buy today. All of them are fairly reliable and provide the best value of money to the buyers along with providing good and healthy drinking water to the family members. 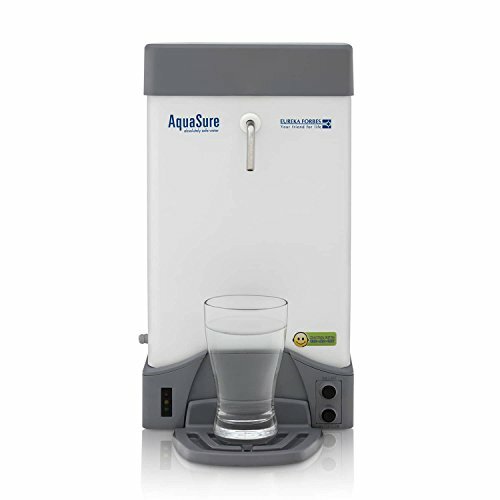 For the buyers who are looking and reliable water purifier for their home which can provide them safest drinking water for years without much maintenance, the Aquasure from Eureka Forbes will be an ideal buy. With a compact design and efficient filtration, this is an ideal entry level UV water purifier that can opt for. Apart from the design and life, another thing that make it an ideal buy for Indian homes is the reliable inbuilt stabilizer that ensures that the water purifiers works perfectly fine even in the lower voltage. 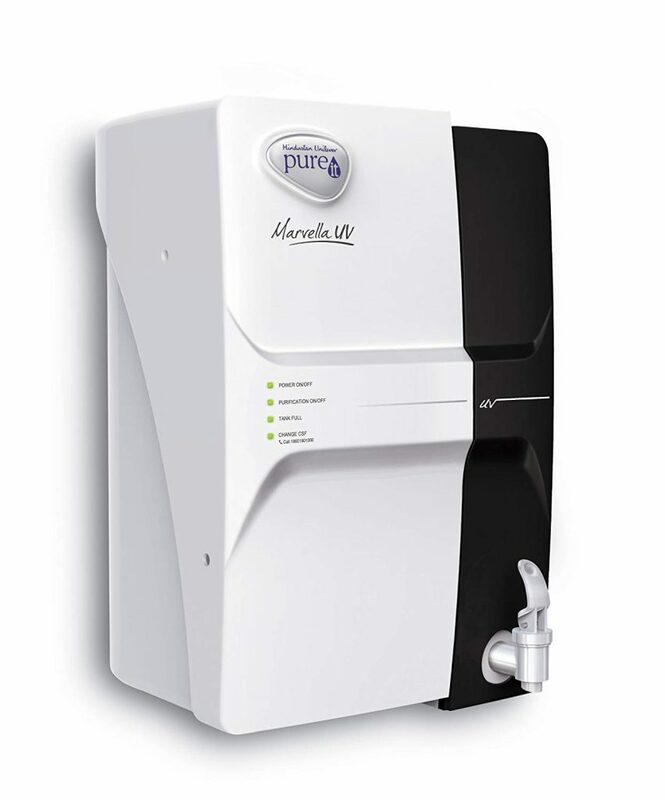 The purifier comes with a 3-stage purification that completely removes all the dissolved impurities in the water to make it perfect safe for drinking. Here are the pros and cons associated with the Eureka Forbes Aquasure that you must know before purchasing one for yourself. Go through them, and then decide whether you should buy this amazingly affordable a compact and efficient purifier for your home, or not. In all, if you were looking for a good and affordable water purifier that comes with a decent warranty, Aquasure from Eureka Forbes will be a perfect product for you to go with. 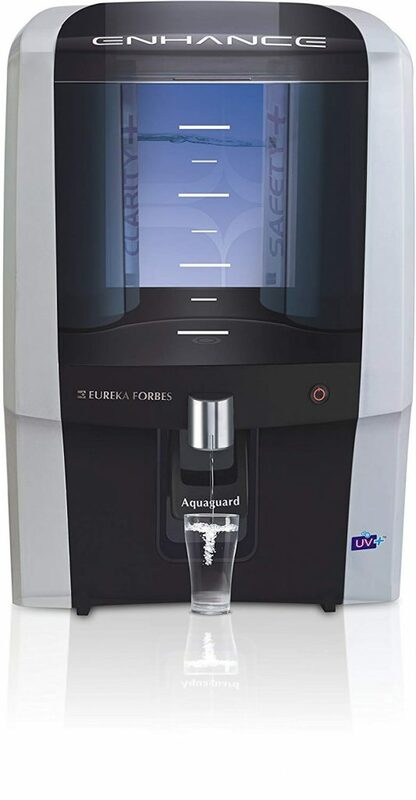 Another amazing water purifier from Eureka Forbes is this efficient Eureka Forbes Aquaguard Enhance that uses the UV+UF techniques to filter the water and make it free for dissolved impurities.7-liter capacity of the filter makes it ideal water purifier with storage for the Indian families. So, instead of buying those expensive purifiers that have no or smaller storage, try finding a perfect deal for the Aquaguard Enhance. Apart from the amazing filtration and easy to use functions, the Enhance has a perfect design that goes with almost every modern India kitchen. The compact dimensions help it to be used even in the smallest kitchen without any issue of free space. The plastic water tank makes it a fairly lightweight purifier so you won’t find any issue while moving your house or removing it from the scratch. Here are the pros and cons that you need to know before investing your money to it. 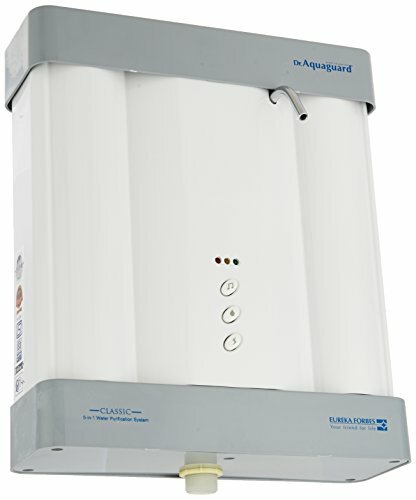 So, if you were looking for a reliable purifier that can last forever, the Aquaguard Enhance would be a great choice for you. For those buyers who are a fan of class Aquaguard design the company entered the Indian market, the Aquaguard classic will be an ideal choice. 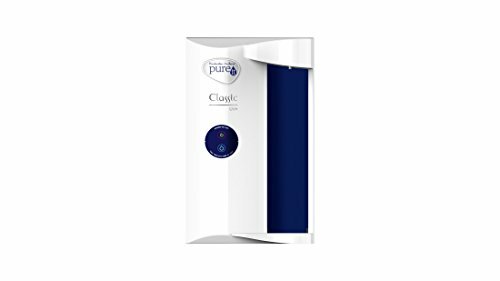 Being in the market from quite a few years now, this purifier is loved by millions of Indian users who love using reliable and easy to clean and maintain purifier. The 3stage purification of the purifier make this a great for the buyers who have relatively cleaner water at home, and just want to be sure of getting tasty water by just a press of button. E-Boiling+ technology ensures that you get water as pure as you would get by the traditional boiling method. Also, a good water flow rate makes it a perfect product for those Indian buyer who do not want to wait to drink a glass of water. Apart from efficient filtration, another great thing about the Aquaguard classic is the minimal maintenance. And by opting for the AMC you can even reduce the cost of maintenance to make it a perfect buy for the Indian buyers. Here are the pros and cons associated with the Aquaguard classic. If you were after a good quality, easy to use and reliable purifier that has a decent storage, then the Kent Maxx would be a perfect purifier for you. With a 7-liter of water holding capacity, this is amongst a very few UV purifiers with storage capacity. The reliable filtration and an impeccable customer care service make it an obvious choice for those buyers who are looking to buy a reliable and efficient UV water purifier for them. Although the maintenance can be a bit higher than the other brands’ purifiers, this purifier from Kent assures that you are getting every water drop as pure as possible. 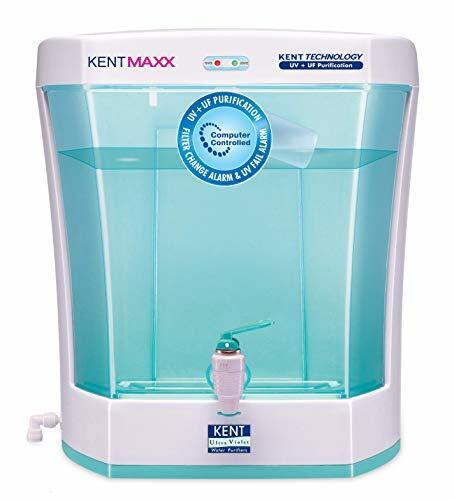 In all, if you were looking for purifier which can be relied upon for quality and efficiency, the Kent Maxx would be the best UV purifier for your home. For the buyers who are planning to buy a compact and great looking water purifier for their homes, the Aquasure would be a great choice. With a compact and lightweight body, this is one of the best-looking water purifiers of this range. The Aquasure from Eureka Forbes has a dedicated glass holding place where you can easily put a glass for the purest possible drinking water. With a Compact design, it can easily be placed to a smallest corner of your kitchen without interfering with the other interiors of the kitchen. Moreover, the modern design enhances the overall looks of your kitchen. The three-stage reliable purification assures that every drop you are getting out from the filter is safe to drink. With relatively higher water flow rate of 2 liter/minute, this is the fastest and most efficient water purifier in this price range. 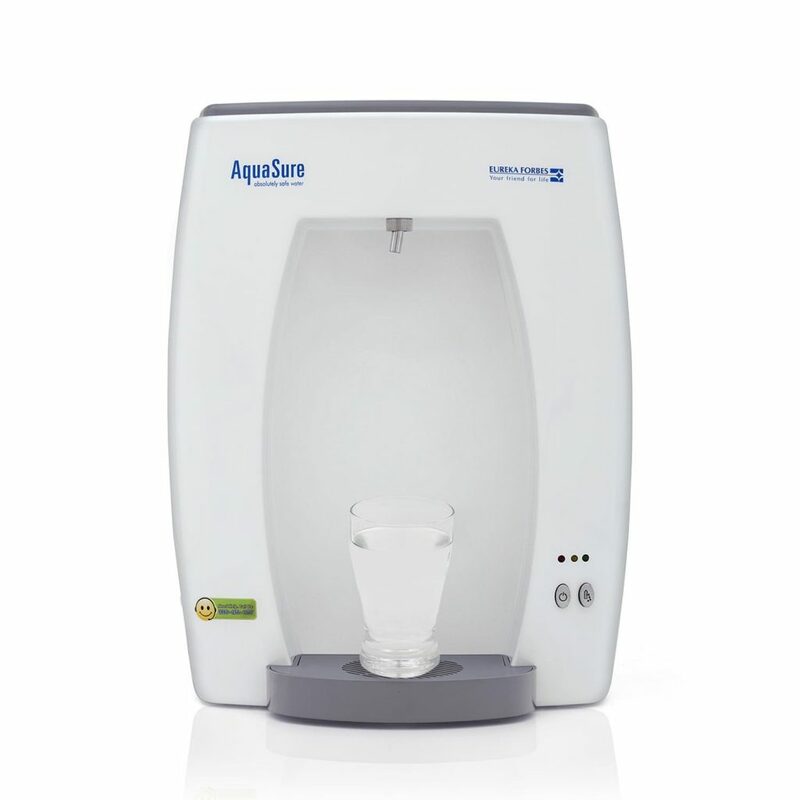 So, if you are willing to buy the best UV water purifier in this price range, then you should not look any further than the Aquaguard Aquasure. 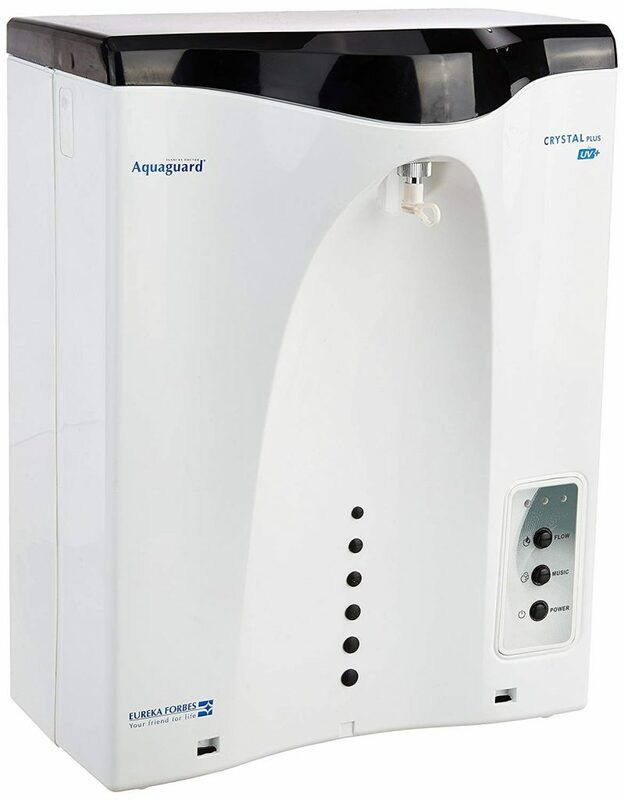 If you were looking for a reliable water purifier for your home, that goes perfectly with the modern interiors of your kitchen and assures you about the best quality drinking water, then you should go with the Aquaguard Crystal Plus. With a really lightweight design and durable build, this purifier has all the features and usability aspects that an ideal UV purifier should have. Along with the design, the three-stage purification method work pretty well for the Indian conditions and you can expect a completely clean water within a few minutes of switching on the purifier. 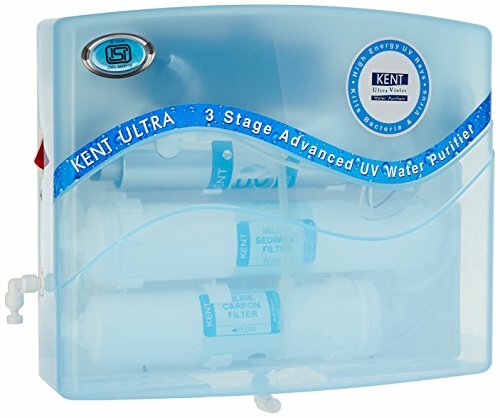 For the buyers who are willing to buy an easy to use and maintain purifier for their home, Kent Ultra would be a great choice. This purifier is popular among those buyers either have smaller kitchens or are planning to buy a compact and efficient UV purifier for their homes. With a transparent body, you can easily spot any impurities in the water, and hence it is a great buy for the buyers looking for quality and efficient filtration. Apart from a great design and efficient 3-stage purification, this purifier from KENT is one of the largest selling UV purifier from the company. So, if you were after quality and efficiency, you should not any further than this amazingly designed UV purifier from Kent. Believe us, you won’t be disappointed by the performance of the purifier, or by the company’s response to your problems. Here are the pros and cons that we came across while reviewing it. 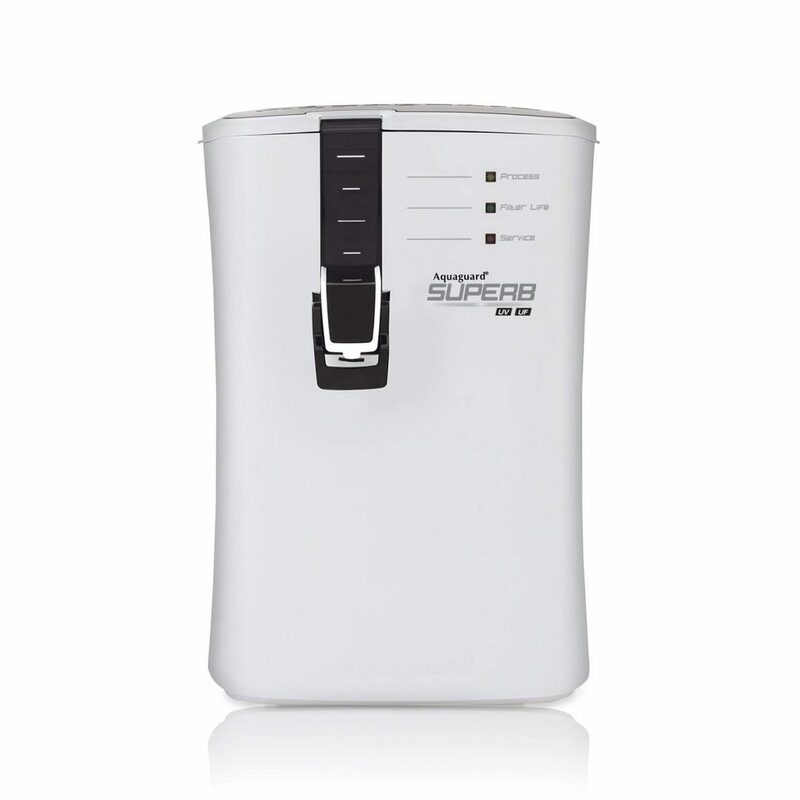 Talking about the design, this is the greatest looking and the most modern UV purifier from Eureka Forbes. Designed especially for the buyers who are having the modern kitchens, this purifier not only looks amazing, but also has the most reliable filtration process in the range. You can easily get it installed by an expert and you are good to go with the purest drinking water that is generally not possible if you were after any other brand and model. The water holding capacity of 6.4 liters makes it a great choice for those buyers who are living in a place with electricity issues. The Dual color tone of the purifier makes it look amazing and if you are looking for the best looking purifier that also purifies the water brilliantly, the Aquaguard Superb would be an ideal buy for your home. If you are willing to buy a reliable and efficient water purifier that not only is affordable but also is compact enough to be used in the smaller kitchen, then your search can end here with HUL Classic UV purifier. The purifier is popular among those buyers who are willing t buy a purifier that not only removes the dust particles from the water but also removes the dissolved impurities like bacteria and germs. With intelligent design tweaks like auto-shutoff, efficient UV lamp and many other, this is a perfect value for money product for the buyers who were looking for a reliable water purification. If you were after a reliable and good-looking UV purifier that not only looks premium but also offers a great filtration, the HUL Pureit Marvella would be an ideal buy for you. With a 4-liter storage, this is an ideal buy for a small Indian family. The unique tap like dispenser makes sure that the water doesn’t get wasted easily. With an extremely low maintenance cost, this is an ideal UV purifier for Indian families. Frequent lamp change can be annoying to some users. You can choose any of the above-listed products according to your needs without worrying about the performance and quality of water being dispensed. So, choose a perfect one for your family and get assured for good health. For those who buyers, who prefer making their own choice the quick buyer’s guide for the best UV water purifier will be quite helpful. So, here are the points that matter a lot while purchasing a UV water purifier for home. Go through them, and remember them while you are out for buying a perfect UV water purifier for yourself. The first thing that you should consider while buying a new UV water purifier for your home is whether the purifier can handle the TDS of your water, or not. Every water purifier is labeled with the TDs level it can handle and you should check it before making the purchase. Also, if you aren’t sure about this, ask the experts or refer to the product brochure to get genuine information. Make sure that the purifier you are planning to buy is durable enough to be used for years. Usually, the water purifiers last for years in a home and buyers often do not look for a replacement too early. So, it is essential that you choose a purifier that is durable enough to be used for years with the least maintenance cost. Brand value also plays an important role when you are buying a water purifier for your home. By relying on a renowned brand, you can be assured of getting the best performance, better service availability, and easier maintenance. Also, you can rely on them for the reliable and latest technology to get the best drinking water. So, instead of choosing any brand or model, prefer buying a well-known brand and popular product that has enough positive reviews from the buyers. Consider the maintenance cost as the hidden cost of the purifier. Choosing a purifier with lesser and inexpensive maintenance can help you a lot to save extra money that would be wasted on the maintenance. So, instead of looking for the cost of the product, make sure that you pay attention to the maintenance cost too. You can opt for the Annual Maintenance Contract with the dealer to make things easier and more manageable to you if you aren’t able to keep records of the maintenance dates. Keeping the above-listed points in mind, you can be assured of getting the best drinking water at home without worrying about the dissolved impurities and bad taste. Additionally, by keeping these points in mind while purchasing a new UV water purifier, you can be sure of getting the best product available in the market that fulfills your needs completely. Here we will talk about the various benefits of using the UV water purifier overt the RO purifiers, the buying guide and the top ten list of the best UV purifiers you can buy in India for 2019. So, be with us until the end and decide which UV water purifier would be an ideal buy for you. As said, the UV water purifiers are still a very popular option for the buyers who are having decent water quality at home and wanted to be sure that their family getting the safe and purest drinking water. There are numerous benefits that UV water purifier provides to the buyer, and here, we are going to talk about the most talked about benefits of the UV purifier that make it a good buy in the year 2019. Just go through these benefits and then decide whether you should go with a UV purifier or search for an ideal RO water purifier for yourself. The first and the best benefit of choosing the UV water filter is they are relatively more affordable in comparison with the RO Water purifiers. Along with the lesser initial costs, UV filters have lesser maintenance cost too. So, if you were after a product that you can buy without worrying about your monthly budget, then you should find a good quality UV water purifier for yourself. Unlike the Ro water purifier which discards the wastewater, the UV water purifier filters every single drop of the water and produces no waste water. This makes it obviously a better choice for those who have a limited water supply at home. The UV water purifiers work best for low TDS. So, if you were looking for an efficient water purifier for your lower TDs water, you will find the UV filter better than those expensive Ro water filters that can’t deal with the lower TDS Value. Another benefit of choosing the UV water purifiers over the RO purifiers is that they extremely easy and affordable to maintain. Not only their filters are cheaper, but they are also less prone to damage caused by missed maintenance schedule. So, if you were after a water purifier that is easy to maintain and deal with, the UV purifier will be the best choice for you. Apart from being affordable, the UV water filters are more reliable than the other types of filters too. The UV filtration technique is considered as the best way to get rid of the micro-bacteria and other germs and is a reliable choice for those buyers who are looking for bacteria-free water for their family. Apart from these, there are numerous other benefits that make the UV water purifier a great choice for homes. So, go for them if the TDS level of your groundwater is lower than usual and you will find the UV water purifier a perfect buy. In all, if you decent quality groundwater, and have a few dissolved impurities with a low TDS, relying on a UV water purifier would be the right choice for you. These purifiers are not only easier to maintain and use, but are also wastes lesser water than the RO purifiers. Also, they are relatively cheaper than RO purifier. So, if you were looking for an affordable choice for your home, then the UV filters would be the best choice to go with. 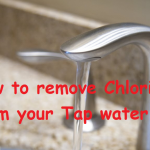 How to remove chlorine from the water you drink? 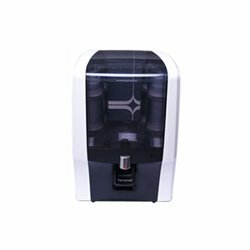 WaterPurifierGuide.In is help you to choosing best water purifier in India. 2019 © Water Purifier Guide. All rights reserved.